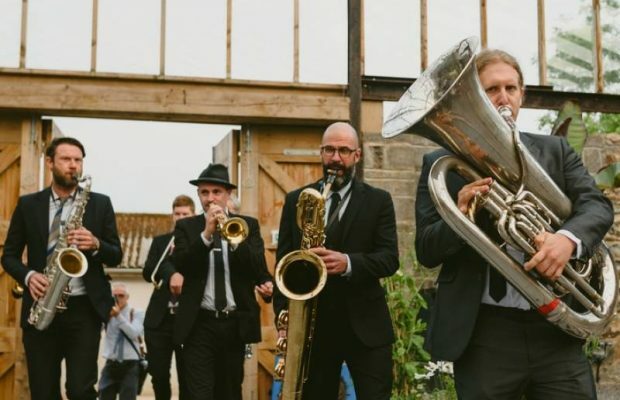 We have wedding bands in Wiltshire to suit all tastes and venues: whether you’re planning a christening at Salisbury Cathedral or a shindig at Stonehenge, we have the perfect musicians for your event. Our Wiltshire bands for hire specialise in floor-filling rock and pop music that all ages can enjoy, but we have bands in all styles, from jazz and swing to ceilidh, ska and Latin. Our acts perform regularly at venues such as Bowood Golf and Country Club, Larmer Tree Gardens and Burcombe Manor. This page is dedicated to bands for after dinner entertainment, but we can provide Wiltshire wedding music for every part of your day. Our musical menu extends from string quartets, harpists and pianists for your wedding ceremony to acoustic singer guitarists for your drinks reception. Our jazz bands in Wiltshire provide gentle, sophisticated background music and are ideal for creating an upbeat, relaxed atmosphere which will help your guests mingle. Book a jazz trio for your reception or wedding meal then take it up a notch later on with a swinging big band. Many can be hired with a vocalist to perform Rat Pack numbers by Sinatra, Buble and Wiltshire native Jamie Cullum! If you want entertainment for families, how about a Wiltshire ceilidh band? A caller can teach you the steps, and they’re great fun for kids! Our Wiltshire wedding bands have performed throughout the county, and in Swindon, Salisbury, Trowbridge, Chippenham, Melksham, Devizes, Warminster, Calne, Westbury, Corsham, Wootton Bassett, Amesbury, Tidworth, Bradford-on-Avon, Bulford Camp, Marlborough, Highworth, Wroughton and Malmesbury. Specialist rock’n’roll and rhythm & blues band from London featuring male vocals, a harmonica player and an authentic vintage repertoire. Variety of line-ups, afternoon entertainment and DJ service available.